How to Be a Werewolf - Surely there are no consequences that might come from this situation. Vote over at TWC and you can see an art! I've been working on this drawing of Charlene forever, and I will continue working on it til I die. Not because it's complex, but because I have no attention span whatsoever. SO MUCH MAGIC! I'm grateful to my past self who decided not to draw all the magic like Marisa's. I feel like the more complex, almost science-y looking magic suits her, though. She primarily uses her magic for fixing things and people. Her magic is very practical and useful, and I like its structured nature. 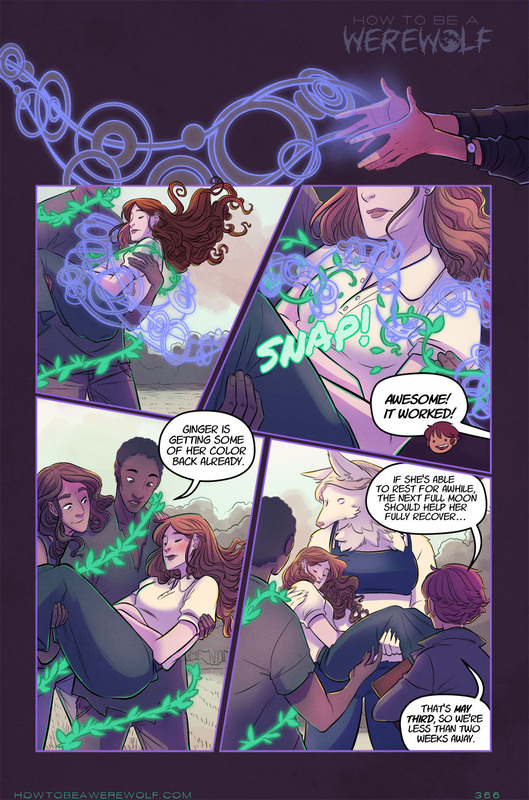 Connie's magic is obviously pretty literal with the vines, but I like how her nature-based magic is paired up with someone who doesn't respect nature at all, and doesn't have a grasp of reality past herself. Connie's magic feels ironic. (The original sketch I drew for this page had her magic as literal chains around everyone, but it felt too obvious.) Anyway, Ginger is free! Surely nothing bad will happen after this! To anyone. All is well, probably. Or not, who knows. (I guess I know.) I'm still working out the very end of this chapter, but that's a tomorrow problem, and not a today problem. Today's problems are mostly taking my old car to get the oxygen sensor fixed, and then dicking around the rest of the afternoon until I have to help with a fundraiser for a local candidate. I'm taking today EASY, because Wednesday is usually my main day off, and I've been packing my Wednesdays full of stuff lately. Time to take an easy day and stay the hell away from the internet O_O. I need a detox! Too much internet is bad for you, I think. (Unless you're reading my comic, which is good for you.) ETA: I updated the last word bubble, because apparently "less than a few weeks away" means "about a week and a half" to Midwesterners, and...not to anyone else lol. The joys of things you say all the time meaning something totally different in other places. And no, I don't say "less than a couple weeks away" for some reason. We're very vague here. Midwesterners don't like numbers.